Three Tennessee sisters "may be in extreme danger" after allegedly being abducted late last month by their mother and a man possibly carrying a gun, the state bureau of investigation said Saturday. An Amber Alert was issued Saturday for the siblings - 14-year-old Adrienne Bain, 12-year-old Alexandra Bain and 8-year-old Kyliyah Bain. They were last seen April 27 in Whiteville, a town of about 4,600 people in western Tennessee. The possibly armed male suspect, Adam Mayes, cut his own hair and may have done the same to the three children, according to the Amber Alert from the Tennessee Bureau of Investigation. The 35-year-old man - who has blue eyes and brown hair, weighs about 175 pounds and stands 6 feet, 3 inches tall - was last seen May 1 in Guntown, Mississippi. Elderly men were keeping watch Saturday over Timbuktu's main library after Islamists burned down a tomb listed as a UNESCO World Heritage site. The attacks Friday were blamed on Ansar Dine, a militant group that seeks to impose strict Sharia law. The ancient city in Mali was captured by at least two separatist Tuareg rebel groups in an anti-government uprising in the northern part of the country that began in January. The rebels burned the tomb of a Sufi saint where people come to pray, said Sankoum Sissoko, a tour guide familiar with the place. He said the library and other heritage sites remained under threat. Horses run down the front stretch during the 137th Kentucky Derby at Churchill Downs on May 7, 2011 in Louisville, Kentucky. Today is the day for the 138th annual Run for the Roses. 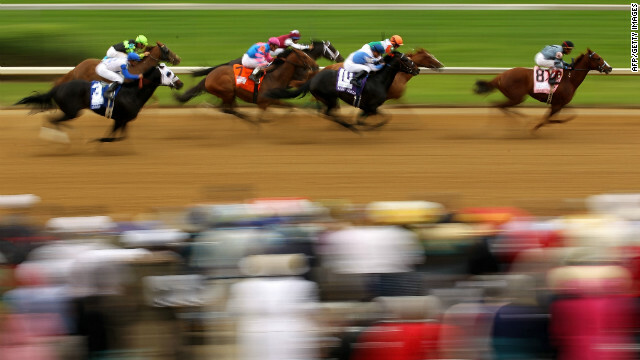 The race is more than mint juleps, elaborate hats and the most exciting two minutes in sports. The Kentucky Derby boasts legends and stars, human and equine alike. You've Gotta Watch a few of the professionals involved in one of the most watched horse races of the year. We've collected videos profiling a top trainer, a jockey making a post-recovery comeback and the stud farm that welcomes the champions after they've won the race. Horse trainer Michael Matz will always be associated with one horse, 2006 Kentucky winner Barbaro. CNN takes a closer look at Venezuelan jockey Ramon Dominguez, just days before he races in the Kentucky Derby. Winning Post gets rare access to Darley Stud in Kentucky to find out more about the business of elite horse breeding. Filed under: Animals • horses • Kentucky • Sports • U.S.